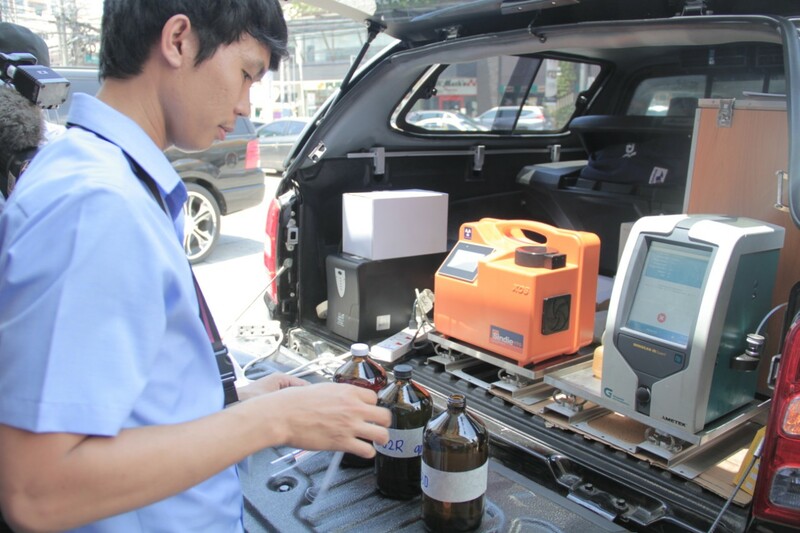 SPOT CHECK: The DOE Oil Industry Management Bureau (OIMB) has lined up 13 gasoline stations in Mandaluyong and Pasig for inspection of fuel quality and quantity. Collecting the fuel samples is OIMB Senior Science Research Specialist Lovely T. Miranda. The OIMB has intensified this regular activity amid the current oil situation. 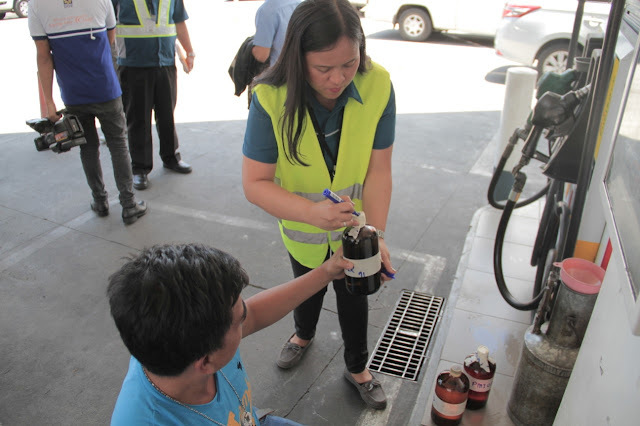 Acting on a directive from Energy Secretary Alfonso G. Cusi, the Department of Energy-Oil Industry Management Bureau (DOE-OIMB) today (23 May) intensified its series of random inspections of fuel stations to ensure quality and quantity of petroleum products amid the current oil situation. Scaling up such regular activity, the OIMB chose around 13 gas stations along Shaw Boulevard traversing the cities of Mandaluyong and Pasig for fuel quality and quantity inspection. “This bold move aims to ensure that consumers are protected despite the increasing oil prices with oil companies delivering the best quality and right quantity of fuel products,” Cusi said. In a meeting with oil companies on Tuesday, Cusi asked oil industry stakeholders to devise measures to address the adverse impact of higher oil prices. “We are here to help one another find ways to cushion the effect of the oil situation, and ensure the utmost protection of our consumers despite the geopolitical factors abroad that we cannot control affecting the world oil market,” Cusi emphasized. As agreed in the said meeting, oil companies have expressed willingness to give discounts and widen their CSR programs to support the transport sector and even the marginalized, which will be formalized through a Memorandum of Agreement (MOA) with the DOE. At present, PUVs avail of a PhP1.00/liter discount under an existing MOA between the DOE and only three oil firms. The DOE is closely coordinating with the Department of Finance to discuss new measures concerning the excise tax and value-added tax on oil as a result of the implementation of the Tax Reform for Acceleration and Inclusion (TRAIN) Law. The DOE will also be working with the Department of Transportation for the swift implementation of Section 82 of the TRAIN Law on fuel vouchers for Public Utility Vehicles (PUVs), and pursue the Department’s efforts to expedite the unbundling of fuel prices. The current increase in the price of oil has been brought about by recent international geopolitical developments, which include US oil sanctions on Iran, the drop in OPEC production levels and the political changes unfolding in Venezuela. Based on International Energy Agency (IEA) reports and Mean of Platts Singapore (MOPS) trends, oil supply and demand in the short and medium term is expected to reach US$80 per barrel.